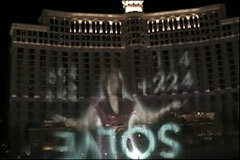 This footage is of the fountain outside the Bellagio in Las Vegas during CES 2007. It’s the first of several clues to be shown in several locations around the world as part of the Vanishing Point contest, the winner of which will be shot into space by Microsoft. At least that’s what Josh of WindowsConnected told me when he gave me the footage at BlogHaus. The actual clue starts about two minutes in. The movie’s probably everywhere by now, but they’re still pretty pictures.